It's all over now... until next year! No can do, this year's Ilosaarirock Festival is over. But what a festival it was! A marvellous weekend full of fantastic shows and fantastic people, and our special thanks for all this happiness goes to you, our dear festival guests. The weekend comes alive again under the Festival Life heading, where you can read stories of some of the highlights of the festival and remember again and again what a great time we all had – until next year, which happens to be the 40th anniversary of Ilosaarirock Festival. The fun is on again between 15th and 17th July, 2011. See you there! The wait is over. 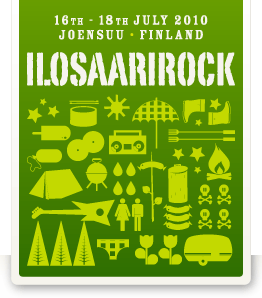 Ilosaarirock Festival 2010 starts today! In a few hours, the action starts at Sulo and Töminä clubs, and tomorrow morning all fun breaks loose at the Laulurinne festival ground. During the next few days, more than 70 acts covering all genres of popular music from jazz to electro to metal will do their best to make this an unforgettable weekend. The English Festival Life section will be regularly updated with stories and pictures, so stay tuned and enjoy the next few days of music, fun and lovely people to the maximum! For the 13th year in a row, Ilosaarirock Festival is sold out again. This means that there will be no tickets available at the festival gates. A small number of tickets for the clubs (Sulo and Töminä) that take place on the Friday before the festival will be on sale at the club gates. Start preparing for the festival now by taking a look at the Festival Guide in English. You can also get a printed copy of the Festival Guide at the Info point in the festival area. Just a few days now before it begins! See you there! Two awaited guests from abroad have been added to the Ilosaarirock line-up: Faith No More (USA) and Biffy Clyro (UK) will join us in July! 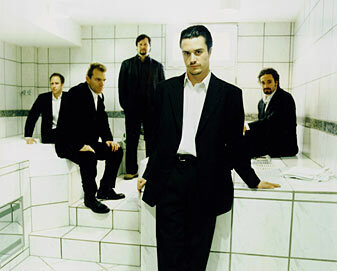 It's hard to imagine a better performer for the festival than Faith No More. This band brings together all kinds of music fans, it's just that damn good. Biffy Clyro from Scotland is predicted to be the next international big thing. Along with these we have announced a bunch of new Finnish additions. The entire list of announced acts can be found under line-up. The Ilosaarirock Festival has revealed its new, fresh look for the summer of 2010 and its first confirmed performers. True to its style, the festival will again bring you a fantastic variety of music from chill-out rhythms to heavier grunting. In July, the Ilosaarirock Festival will present punk rock veterans Bad Religion (USA), instrumental hiphop star DJ Shadow (USA), experimental electronic rock band UNKLE (LIVE) (UK) and metal group Katatonia (SWE). A list of the artists who have confirmed their arrival can be found here. The list of bands has been updated 6th April 2010. This is complete line-up. Again this year, we also have Tunnelmissa Reggae Disco located near the Rento Stage.